On this page you will find a brief history of the festival, the team behind it, vendors attending, plus photos and logos that can be used. Please email press@holmfirthfoodanddrink.org if you have any other questions or would like to arrange an interview. The Holmfirth Food and Drink Festival returns for its 13th year on 28th and 29th September 2019 and promises to be another jam-packed weekend with food markets, live music and entertainment. Holmfirth is the place for food lovers when the annual food and drink festival takes place. Whether you are a serious foodie or someone who just appreciates good food and drink, there is more than enough at our festival to ensure that you and your friends and family have a great time. A fabulous food market is open each day with stalls lining the streets throughout the town, offering a range of mouth-watering delights. This year we are once again partnering with fairandfunky who are transforming the Market Hall into a showcase for local, Fairtrade and ethical businesses. It promises to be a lively, engaging and interactive addition to the festival with live music and competitions for all the family in the heart of the Yorkshire Pennines. The team behind the Holmfirth Food and Drink Festival is made up of a mix of local business owners and volunteers. The team helps with operational support, manages social media and also closely advises as we have members who attend other UK and European festivals. For a full list of team members, please see the Meet the Team page. This year we are once again partnering with fairandfunky to offer a ‘Family Food Zone’ in the Market Hall. This was a huge success last year and they will be back transforming the market hall into a showcase of local, Fairtrade and ethical businesses. This promises to be a lively, engaging and interactive addition to the festival with live music and competitions for all the family. We are always looking for sponsorship for Holmfirth Food and Drink Festival. 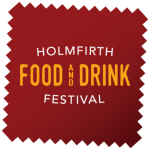 If you are interested in sponsoring the festival please get in touch sponsors@holmfirthfoodanddrink.org. We have been very fortunate to have received sponsorship and support from several businesses for the 2018 festival. We will update this list as and when agreements are made. The Holmfirth Food and Drink Festival was setup in 2005 in partnership with Kirklees Council who ran the festival annually until 2013. In 2014, Kirklees announced they would no longer be able to support this popular event and so a number of local businesses and community members took on the role of running the festival. 2015 was the 10th Anniversary and saw an estimated 40,000 people coming to Holmfirth over the two-day event. You can find high res images, logos and other images from our Press Kit Dropbox Folder. We ask that you please credit photographers where appropriate. Please see the separate page for a full list of Attending Vendors. Holmfirth Food and Drink Festival sees over 50 outside vendors, the majority of which are local but we do attract traders from all over the UK. The partnership with fairandfunky brings an additional 25 traders in the market hall over Saturday and Sunday. The festival entertainment includes everything from face painting, competitions, festival buskers and popup street artists. There will be lots going on and something for everyone. View our full entertainment line-up here. We would like to ensure that the Holmfirth Food and Drink festival continues for years to come, the two big factors in this are making the festival a long term sustainable event, and ensuring that we have the help and support from volunteers. The festival team is open for discussions with businesses or other organisations to help make that happen and all ideas will be considered. If you would like to take on a role or would like to discuss other opportunities we would love to hear from you!